During the February Congressional recess, the Brunswick County Association of REALTORS held their annual legislative breakfast, which was facilitated by BASE and featured Congressman David Rouzer. Congressman Rouzer gave updates on a number of specific national issues including tax reform and health care reform. Having recently returned from a trip to the border in Texas, he gave a frank assessment of the challenges regarding immigration and border security. With federal issues at the forefront of many conversations, we are staying on top of a variety of issues. Appointments, health care, Waters of the US, flood insurance and regulatory reform remain on our radar. At press time, it is anticipated that tax reform and EPA reform could be two issues which become more prominent in the near future. 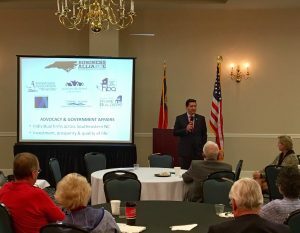 In addition to remarks from Congressman Rouzer, two members of Brunswick’s legislative delegation spoke regarding ongoing initiatives in Raleigh. Rep. Frank Iler and Rep. Deb Butler discussed education funding, transportation funding and the need for a state shoreline fund. Brunswick County Chairman Frank Williams also gave an update regarding several specific issues on the County Commission radar.